Imagine this: You check your books and find that a customer is late with a payment. You contact the accounts payable clerk and realize the company didn’t pay because your invoice was wrong. Now you have to rebill the customer — a rework process that costs you time and money. And to top it all off, the new bill has today’s date, not the date of the original invoice, so you’ll receive the payment even later. decrease customer satisfaction. If your patrons frequently receive incorrect statements, it’s likely they will become frustrated because it also costs them time and money to find the mistakes. interrupt cash flow. No business can afford to finance cash shortfalls while waiting for the dispute to be resolved and payment to be received. cost your business money. Most obvious, paying to redo work is a not a cost-effective use of money. For most credit managers, eliminating invoice errors requires two simple steps: recognizing the most common mistakes and employing best practices to prevent them. Mistakes can happen in many ways, but a handful of errors tend to show up most frequently. Proofreading mistakes — Double-check your work for typos, reversed numbers, or missing information. Missing due date — Be sure to include the date payment must be received. Lack of professionalism — Make sure invoices include all pertinent information, including your contact information, website URL, and logo. Poor organization — Include an itemized, detailed list of all charges on each invoice so clients clearly understand what they’re paying for. Neglecting to send — Sounds crazy, but businesses often forget to invoice — or they send the bill to the wrong client. Both errors guarantee nonpayment! Purchase order errors — Be sure your invoices reflect the correct and total purchase order information. This will help customers quickly match their orders to your invoices. No follow-up — Once you send your invoices, follow up with reminders to make sure you receive compensation for your work or goods. Establish a system and stick to it. Use the same template or program for creating all invoices, keep all data in the same location, and so on. That way, when you’re ready to invoice clients, you’re not searching for information or skipping details. Check and double-check your work. Make sure there aren’t any typos or confusing information, so you have to send the statement only once. Include as many details as possible. Include your payment terms and any discounts for early or on-time payments, itemize purchases or work provided, and make due dates easy to see. Make time for invoicing. 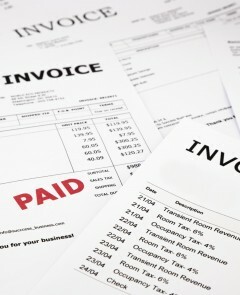 Don’t invoice as an afterthought or rush through the process. Give yourself time to work on this project to reduce mistakes. Once you have invoicing down to an accurate science, be sure to follow up on any unpaid statements with a predictable, proactive collections process to ensure your company gets paid. This entry was posted on Thursday, May 5th, 2016 at 2:15 pm	and is filed under Cash Flow. You can follow any responses to this entry through the RSS 2.0 feed. Both comments and pings are currently closed.